“JERSEY SHORE’S” SNOOKIE MUGSHOT PROVES SHE IS A BODY SNATCHER. Home → Damien Zone → “JERSEY SHORE’S” SNOOKIE MUGSHOT PROVES SHE IS A BODY SNATCHER. Seaside Heights, New Jersey police have found giant pea pods in the basement of the home shared by the MTV cast of “Jersey Shore” and they belong to Snookie — an alien life form. 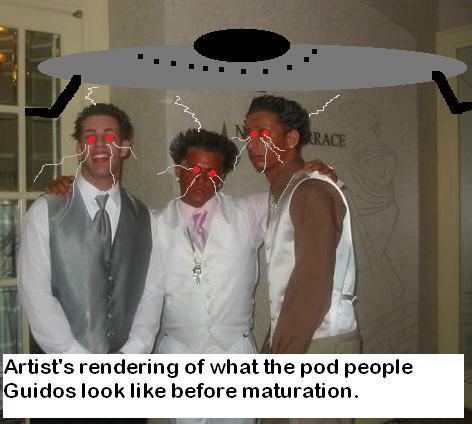 DNA tests on the pods have proven that they are genetic reproductions of several muscular Guidos who have been reported missing over the past several years. 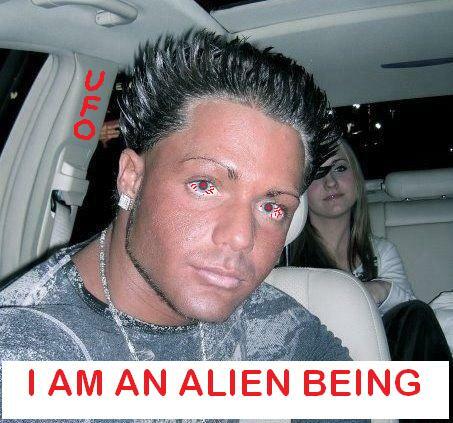 Further investigation by local authorities led police to a space ship that was hidden deep in the New Jersey Pine Barrens where they found cast member Snookie and several unidentified aliens holding other muscular, piereced and tattoed Guidos in states of suspended animation. Doctors are unsure of how to de-suspend the Guidos and efforts to revive them have proven fruitless. Currently there are dozens of these Guidos on the craft. How many are already out and on the prowl is unknown. There has been a rash of missing Guidos over the past year and many parents and friends have formed the MGFSHTF — The Missing Guido From Seaside Heights Task Force. “My Anthony went to Ortley Beach last August and we never heard from him again, ” said a teary-eyed Connie DeGennaro of Demerest, New Jersey. Snookie remained defiant in the face of CIA and FBI investigators. She spit in the face of a MUFON (Mutual UFO Network) Investigator. Mike “The Situation” Sorrentino was shocked when heard the news. For decades, the quiet semi white-trash residents of the barrier island on which Seaside Heights lies, have had to deal with the seasonal influx of Guidos and North Jersey decadence, but now they are threatened even more by the arrival of Snookie and her evil army of body snatchers. Snookie is being held in the Area 51 in the Nevada desert and is under constant watch, but it’s only a matter of time before her army of alien Guidos comes to rescue her.